By the time the U.S. entered World War I, black soldiers and white Texas civilians had a history of hostile relations dating back more than fifty years. At Camp Logan, men with the Third Battalion of the Twenty-fourth U.S. Infantry Regiment faced increasing harassment from Houston authorities. On August 23, 1917, a rumor reached the camp that Corporal Charles Baltimore had been killed for interfering with the detention and interrogation of a black woman by Houston police; in fact, Baltimore had been beaten but survived and was later released. Reacting to the rumor and to racial discrimination, about 150 black troops marched for two hours through Houston. As local whites armed themselves, a violent confrontation ensued that claimed the lives of four black soldiers and fifteen local residents, and wounded a dozen others. The soldiers’ leader, Sergeant Vida Henry, killed himself after the death of a National Guardsman whom the troops had mistaken for a policeman. The group subsequently fell into disarray and the violence dissipated. In November, the largest court-martial in U.S. military history convened at Fort Sam Houston in San Antonio to try sixty-three soldiers from the Third Battalion. Thirteen of the convicted men were executed by hanging on December 11. The following year, two additional courts-martial were held and another sixteen sentenced to hang. Responding to pressure from black leaders, President Woodrow Wilson commuted the death sentences of ten of the condemned men. In total, nearly sixty soldiers received life imprisonment for their roles in the affair. 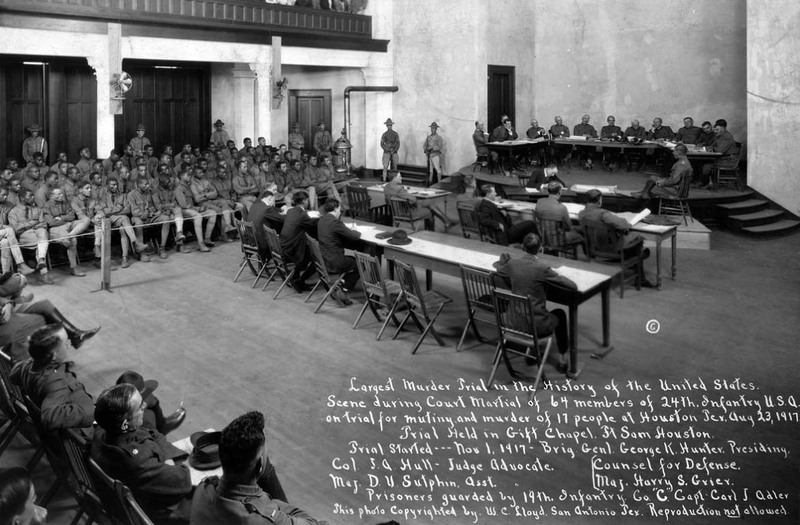 The Houston Mutiny anticipated the “Red Summer” riots of 1919 in which many African American servicemen retaliated against white mistreatment. On the other hand because of the Mutiny, the Twenty-fourth Infantry Regiment was not allowed by the U.S War Department to go to France to fight in World War I.